Sicily holds largely unlocked potential for Syrah thinks veteran winemaker Peter Vinding-Diers, who has a new project on the Italian island. Speaking to the drinks business at the trade tasting of his new UK importers, Swig Wines, Vinding-Diers said he had first “ended up in Sicily on an old volcano” in 2005. Five years later, after a bit of tinkering in some local vineyards, a house was added in 2010 and more vineyards were planted, leading to the creation of Vinding Montecarrubo. 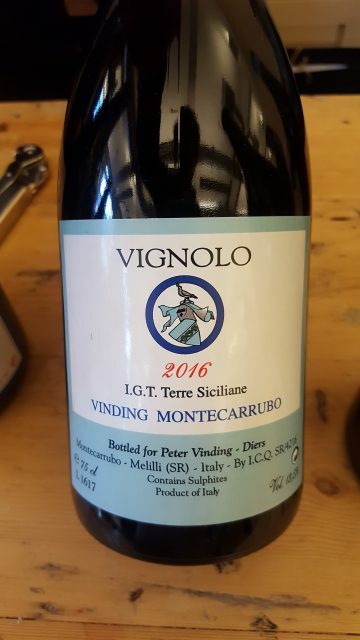 However, rather than settling down with local Sicilian varieties, Vinding-Diers has a very little Merlot and Cabernet Franc and has really set his sights on the potential for Syrah in Sicily. He has tried to work with Nero d’Avola at various points over the last 15 years but, he concludes: “ I hate it. It’s very primitive and makes coarse wines,” although he freely admits this is a legacy of his many decades making wine in Bordeaux. But in Syrah he thinks he has found the right match for the volcanic and chalky soils, coupled with cool nights that settle on the extinct volcano. Encouraging words from his nephew Peter Sisseck, South African Eben Sadie and Le Pin’s Fiona and Jacques Thienpont have only confirmed his initial view. “I think Sicily is the undiscovered terroir,” he told db, when asked about Syrah’s role and future on the island. Despite being an outsider, Syrah has been planted on Sicily for 150 years or so but, as far as can be ascertained, no one has ever thought to make any selections of it (a problem Vinding-Diers may be the case with Nero d’Avola as well). Although he likes what ‘Sicilian Syrah’ has to offer, in 2010 he also made sure to plant a massal selection of Syrah he sourced “from a friend” in the Rhône. The results (both sets of clonal stock are planted in volcanic soil too) are strikingly different, with the ‘Rhône selection’ offering more focus and lift to the Sicilian’s broader, warmer profile. As well as bottling them individually, Vinding–Diers also makes a blend of both and will no doubt be on the lookout to start making some selections of Sicilian Syrah in the near future.